Northwest of Jonesboro on Highway 63. It sits on the right side of the highway just as you enter the town going west. The raven stands guard over the town of Ravenden. It always brings me a smile as I travel. I'd say it's worth a photo op. No one seems to know if the name Ravenden has anything to do with ravens, but the town decided to build a big one anyway. Right off the highway, this statue has easy access. FYI there is a pretty neat sundial to the right of the statue, about 20 feet away. The big raven is still sturdy and standing tall! If you're driving through this little town, you can't miss it. Easy to find, parking simple and very accessible. The shrubs have grown up a bit since the original RA photo was taken so it's difficult to get the whole raven and the sign at the base in one shot. Nonetheless, it's a neat sight! 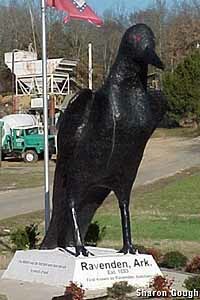 This raven statue is located. It is 12 feet high. Due to vandalism of the first 2 birds placed (they were fiberglass) , this last bird was made of cement and stucco, and has stood triumphant for several years now. Arkansas Traveller Russell T. Johnson reports that the first two were burned down by vandals. "Completed in 1996, and still intact, the third bird is coated with fire-retardant paint." Olie's Barber Shop: Trump Trim, Ravenden, AR - < 1 mi. The Pocahontas Meteor, Pocahontas, AR - 16 mi. Elvis and Tiny Elvis on a Fire Truck, Portia, AR - 15 mi. Beatles Abbey Road in Arkansas, Walnut Ridge, AR - 20 mi.